In this tutorial you will learn how to add a private file to a specific user. Instead of adding a file to a whole group (see tutorial here), it's also possible to add a file to a specific user. You can add any file to a group, but we don't recommend to add files files that are very large in size. Step 1. 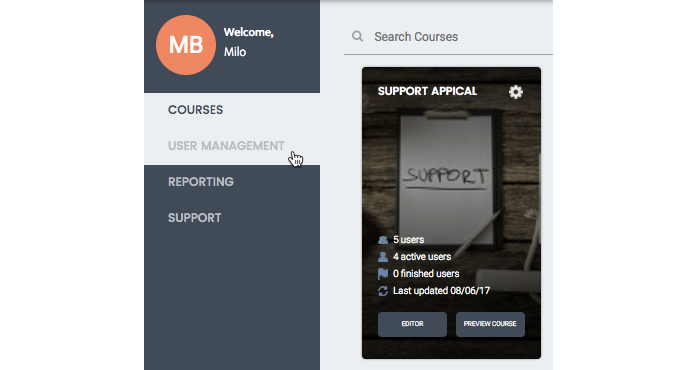 Click on User Management in the menu on the left. Step 2. Search for the user in the search bar and click on his/her name to open the profile. Step 3. Click on 'Add Private Files' and select the file that you want to upload. If found, select the file and click on 'Open' to upload it. The file will now be available for the user. Congratulations! You now know how to add a file to a specific user.